"Form follows function - that has been misunderstood. Form and function should be one, joined in a spiritual union." - Frank Lloyd Wright. Could your commercial floor plan be partly responsible for ineffective office practices? Are you using every space in your corporate office plan efficiently? A survey conducted by IPSOS, a global research firm, unveils a direct relationship between an employee’s satisfaction with their working environment and the level of engagement they have with their work. The survey concluded that a mere 11% of those asked were actually satisfied with the environment where they work. That same group of people also turned out to be more highly engaged at work than their co-workers. Of the top-engaged and most highly satisfied with their professional work space, 98% said they could concentrate easily, 97% said they could freely express and share ideas, 95% conveyed that they could work in teams without being interrupted, and 88% replied that they could choose where in their office they could work, depending on the task they needed to accomplish. Additionally, 95% of respondents expressed that they were allowed to feel calm and relaxed at work, and 97% told surveyors that they felt a sense of belonging to their company and the company’s culture. The same study uncovered the high cost of disengagement to business across the globe. In the United States, between $450 Billion and $550 Billion is lost each year to employee disengagement. There are a few easy things that you can do, though, to improve your commercial floor plan in order to promote a more optimal work environment for everyone. Most corporate office spaces can business floor plans can benefit from these commercial interior design tips. Since every employee is likely to want something different, it might behoove you to consider different options for your office layout. Open office spaces can promote collaboration between coworkers, and enhance productivity among employees, by aiding in a better and more open flow of communication between collaborators and between different departments. When communication gets better, the whole workflow becomes more efficient. Floor plans provide a way to visualize how people will potentially move through a certain space. When deciding on a new commercial floor plan, take note of how certain spaces in the office are used. Observe and identify high traffic spaces and how those that are under trafficked can be improved upon to help redistribute movement. From a data science perspective, there are new innovations and tools like motion trail sensing technology to help draw connections between space and use. Improving the flow of your business floor plan can help balance productivity and engagement by allowing for a more continuous working experience. Measure, measure, measure - walls, doorways, windows, note permanent fixtures, etc. Keep sights in mind - what do you want inhabitants to see? The common practice in open office floor plan has been to eliminate walls and place desks as close together as possible, in an attempt to encourage human interaction. That trend is often cited as being responsible for the success of big companies. But a new, more practical approach, consists of creating a flexible environment to address different needs at different times, without compromising overall productivity and performance. Though there are many benefits to open office spaces, there are significant drawbacks as well. Employees enjoy the open spaces and natural lighting, and tend to be happier overall when around their peers than being segregated into compartments, but the lack of privacy can lead to distractions and potentially tension in the workplace. Without a way to isolate yourself when you need to concentrate or simply don’t want to talk, you can find yourself feeling exposed to the whims of othersand devoid of any privacy without retreating to a bathroom stall. Wide-open office spaces just aren’t the best option if you need to make phone calls, or deal with anything of a confidential nature during your workday. Depending on the specifics of your industry and the particular people surrounding you, an open floor plan might actually hurt your company’s overall productivity. 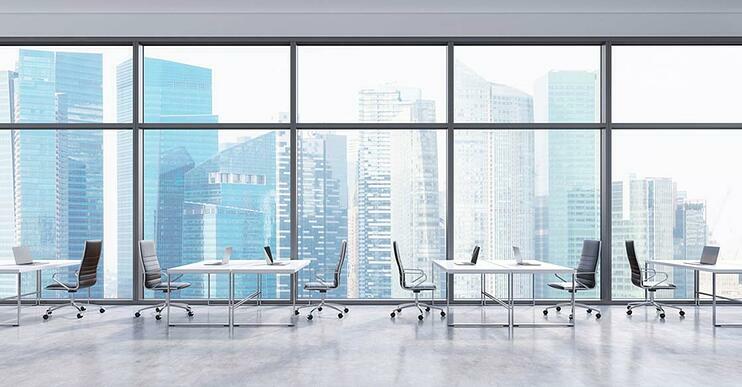 Using interior glass walls expands open spaces visually while reducing noise pollution and carries the added benefit of creating a healthier setting. The transparency of the glass also adds to the social transparency of the office, enabling a communal atmosphere while retaining some of the privacy that closed spaces offer. Modern and appealing flexible office floor plans can be easily created and modified by using interior frameless glass walls and frameless sliding glass doors. The aesthetic appeal of combined with their ease-of-use makes them a no-brainer for the astute office manager to integrate into their office to optimize their floor plan. The panels can easily be moved to expose or isolate spaces, create a boardroom or a private office, or a big room for office parties. Consider a flexible office floor plan as a viable alternative to the two extremes that combines the best of both.